Songkran: what is it and why is it one of my favorite holidays? Songkran, also called” water festival”, is one of the biggest Buddhist holidays in Thailand. It is an annual holiday in Thailand that is celebrated mid April. Each year Songkran is held from the 13th through the 15th of April. In some places the celebration even lasts for a whole week. On Songkran people celebrate the traditional Thai New Year. The official New Year is celebrated on the 1st of January like in most other countries. The traditional Thai New Year is celebrated on the streets where people throw water at each other. They use all kinds of gear; think of water pistols, buckets, garden hoses, etc. All with one goal: to get everybody soaking wet. The idea behind it is that the water cleans you so you will go into the New Year with a fresh start. Another tradition is to put white clay on people’s faces. This comes from the chalk monk’s use for blessings. The festivities take place throughout the whole country. However, most Thai people go back to their home town to celebrate the holiday with their families. 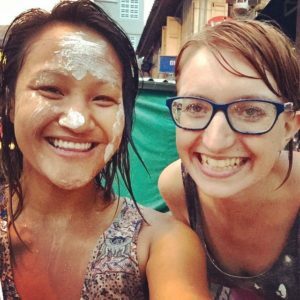 Three years ago, in 2015, I was in Thailand during Songkran. I was planning on celebrating it in Chiang Mai, because I heard it’s one of the best places to experience this holiday. My plans changed though, so I ended up celebrating it in Bangkok with a friend. I thought the atmosphere during this holiday was absolutely great. I have been to places with big crowds and drunken people before but that often causes problems (e.g. people fighting). During the days I was there I didn’t feel like I was in danger for a moment even though the crowds were pretty large. I’m sure things happen during celebrations like this but luckily my experiences were very positive. Another thing I thought was so much fun were all the water fights on the streets. For three days it felt like I was a child again. I really enjoyed the water fights and even purchased my own water gun after some hesitation at first. It was absolutely necessary though since you cannot participate thoroughly if you yourself are not able to splash water at other people. The last thing I loved about Songkran was that I felt included. Sometimes when you’re abroad and there is a celebration you kind of feel like an outsider. I had this when I was in Vietnam during Tết (Chinese New Year). Everyone was celebrating this with their families and I didn’t really feel like I was a part of it. During Songkran though, everybody is included. It doesn’t matter whether you’re Thai or not. Many Thai people even seem to like it to see all the farang (foreigners) celebrating with them. This year I will be in Thailand for Songkran aigan. Since I’m in the South already I will go to Krabi and celebrate it there. I hope it will be as much fun as I remember it to be three years ago. Have you ever celebrated Songkran? If so, how was that?